Is there really a better way to celebrate the Rio Olympics this August than by giving you your chance at gold when you deposit as little as $30? You've made it this far Uptown and we want to reward you with two huge bonuses and many Free Spins! Julius Caesar was the most powerful man in Rome; Cleopatra was the only ruler of her dynasty and the queen of Egypt, and Achilles the Greek mythological hero of the Trojan War. And now these magnificent characters are part of your Olympic wins this August! Spin the reels of Caesar's Empire, Cleopatra's Gold and Achilles for free and you'll come out as victorious as a gold medal winner! 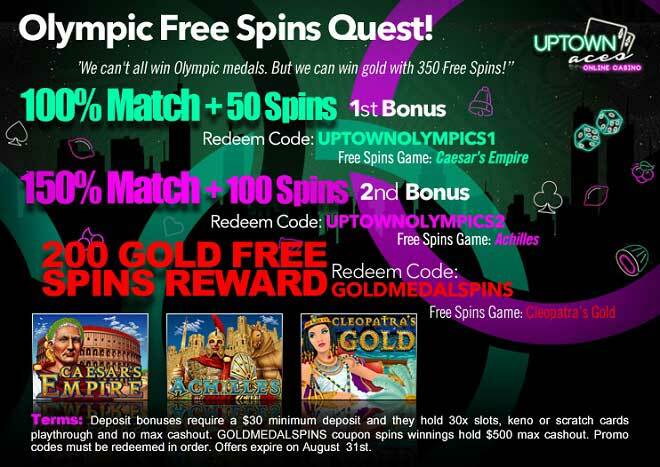 Reach Uptown's own Olympic podium this August after you've deposited as little as $30 that will win you a 100% Match, followed by a 150% Bonus and Free Spins!